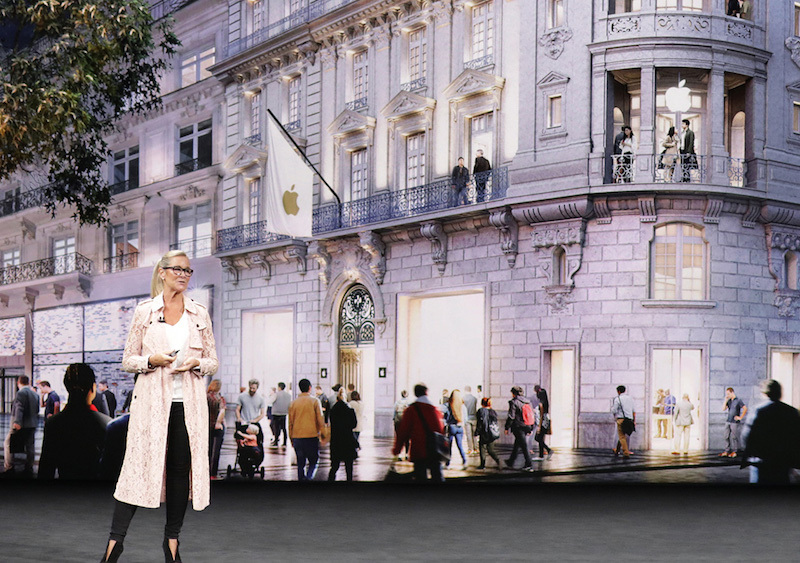 In a new interview with Vogue Business this week, Apple retail chief Angela Ahrendts has talked about Apple's approach to "experiential" retail. Namely, Ahrendts discussed Apple's ongoing expansion of Today at Apple sessions, which transform the company's retail stores into communal spaces for classes, how-to sessions, photo tours, and more. The interview took place near Carnegie Library in Washington, D.C., where Apple's next major retail store will open soon. Ahrendts explained that the location will become a community hub for the area, including field trips for local schools and off-site walking tours of the nearby sites in Washington, D.C., teaching attendees how to capture the best photos on iPhone or sketch landmarks on iPad. Ahrendts remarked that Apple's goal is to continue the vision for retail that began with Apple co-founder Steve Jobs. To manage an employee network of 70,000 people, each retail worker starts their day using an app called Hello, including briefings on important matters for the day with videos from Ahrendts and her team. There's also a partner app, Loop, that acts as an internal social network for staff members. The retail chief said this internal communication between Apple and its retail employees is critical, and what's missing from a lot of other brands. This Spring will mark the two year anniversary of Today at Apple sessions, which began expanding worldwide in May 2017. Ahrendts spearheaded the launch, kicking off the transformation of traditional Apple retail stores into "modern-day town squares" and hubs of education. Before the debut of Today at Apple, the company hinted at its upcoming retail changes by dropping the word "Store" from the Apple Store branding. In the article, Vogue Business pointed out that since 2017 nearly 10,000 brick-and-mortar stores in the United States have closed, and analysts predict one in four U.S. malls will be out of business by 2022. Ahrendts explained that Apple's approach is "very different...from traditional retailers," because the company focuses on the effect of its branding on customers over profitability. "One of the things we've had to do at Apple is to stop looking at everything on a linear basis," she said. "You can't just look at the profitability of one store or the profitability of one app or the online business. You have to put it all together: one customer, one brand." According to Ahrendts, "The tragedy in retail" for other brands is that they are too focused on numbers instead of focusing on and investing in their own employees, "and in that environment, big isn’t always good." You can check out the rest of the Vogue Business interview right here. I hate going into the Apple Store these days. I avoid these ‘stores’ as much as possible. They are always crowded with angry people waiting for service at the ‘Genius’ Bar. No Apple you are not the next Starbucks. As much as Starbucks would like to sell me a $3,000 Latte Pro, it isn’t happening. Focus on technology and keeping people happy with your products. "I think as humans we still need gathering places," Ahrendts says. "And when you are serving digital natives, the thing they long for more than anything is human connection. Eye contact." Serving digital natives? Eye contact? Ahrendts speaking in tongues using platitudes and gobbledygook. Apple has recently spoilt the look and feel of my local "town square" by putting up adverts for for the iPhone XR and various trade in programs all over the front windows. Glad they aren't just focussing on sales and numbers..
ROFL. Apple needs to get over their idiotic hyperbole and get back to making products. The Apple store has become a miserable experience. The stench in their stores is so gross if I do actually need to buy something I'll go into a best buy instead. The staff is rude and non-helpful and seems to try and evade customers. What a difference from 5 years ago. It wasn't that many years ago that they replaced the logic board on my MBP just because I complained the audio wasn't switching to the earphones properly when I plugged it in, even though they couldn't replicate the problem. These days they will say or do anything to avoid repairing things. I remember when my iPad 1's cable failed. The Apple worker didn't even test it, he took a brand new retail boxed one off the shelf, opened it, handed me the cable and took the broken one. Imagine an Apple store doing that now. Laughable. My first 3.5mm-lightening adapter failed less than a year after the 7 came out. So every single one was under warranty, and Apple still wouldn't replace it. Ahrendts explained that the location will become a community hub for the area, including field trips for local schools and off-site walking tours of the nearby sites in Washington, D.C.
You're a cell phone store. Not a major attraction. It is just sad and pathetic if you're a field trip destination, and I'd sure be complaining to the principal if I were a parent of one of those kids. Let's see, should we take our kids on a tour of the Capitol or of the local Apple store. Disgusting Angela. each retail worker starts their day using an app called Hello, including briefings on important matters for the day with videos from Ahrendts and her team. Wow...Cringe. 1984 is here and thy name is Apple. I feel sorry for Apple retail workers having to work for this hag. "Just tired of seeing people act like companies can’t work on multiple projects at once." I’d have more respect for this woman if she was more honest: it’s all about selling iToys. “We want to enrich people’s lives...by selling a $1,500 iPhone!” Disgusting. All Apple wants to enrich is their profits. High fashion people think they re hip whatever they wear, say, or do, while they are actually a boring bunch.